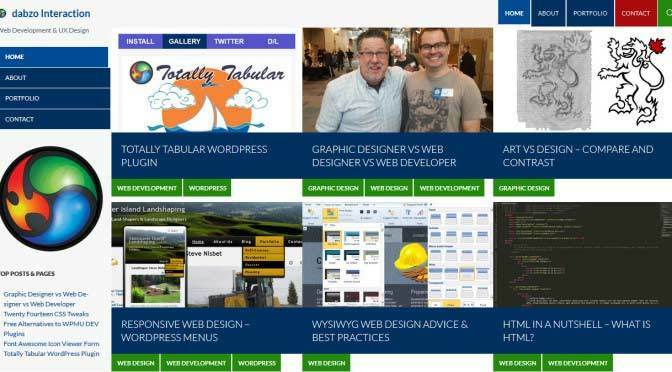 * Updated for twentyfourteen v:1.2 * I built a WordPress Twentyfourteen child-theme for this site recently. It’s nothing special but has a couple of design tweaks which I think work well. In this child-theme I’ve also tweaked the seo a bit – 5-10 h1 tags per page just didn’t look right. Also, I was terminally lazy in my styling & so re_enqued the entire style.css in the child-theme instead of applying granular overrides. This thing is pretty out of date, but hey if you want a copy have at it. I’d like to write my own class for the featured-content which would allow users to choose between featured posts or featured pages being displayed – But that will have to wait for now. Remember to use child-themes wherever possible, rather than editing existing themes – Which could get updated, causing your edits to be overwritten. //echo 'alert("heya! ")'; // Commented-out Trailing alert to quickly un-comment-out and verify if our JS is loading - echo 'console.log("heya! ");'; would work fine here too.